Each year, the United States celebrates Saint Patrick's Day on March 17. No matter which day of the week this popular holiday falls, different cities will celebrate with big parades, live music, Irish food, and a variety of other festivities. Whether you're Irish or not, Saint Patrick's Day — or Saint Paddy's Day, as some call it— can be a fun time for the "wearing o' the green," watching a parade, or getting together with friends for a pint. A number of USA cities have formal Saint Patrick's Day celebrations, complete with marching bands and baton twirlers, while other places use the day to throw a big party. Here are some of the best places in the U.S. to celebrate Saint Patrick's Day. The Saint Patrick's Day Parade in New York City is one of the largest parades in the city, and the nation. The parade features approximately 150,000 marchers, including bagpipers. The NYC St. Patrick's Day Parade route is on Fifth Avenue between 44th and 79th Streets. Another way to celebrate St. Patrick's Day in New York City is by visiting one of NYC's Irish Pubs. The second biggest and perhaps the most unique Saint Patrick's Day celebration in the country takes place in Chicago, where they dye the Chicago River green for the Irish holiday. The privately-funded endeavor has been taking place for almost half a century in the Second City and raises nary a concern among environmental activists there. In addition to the greening of the Chicago River, you can also take in the Chicago St. Patrick's Day Parade, which marches up Columbus Drive. Bringing out 750,000 excited visitors, the coastal southern city of Savannah, Georgia, holds St. Paddy's celebrations for several days, which include the "greening" of Forsyth Park Fountain and accompanying food and music festivals. The heat of Savannah makes it perfect weather to enjoy a couple of cool pints of Guinness. Known for its long-standing Irish heritage, Boston is an obvious choice for celebrating St. Patrick's Day. Its parade is also one of the nation's biggest and there are celebrations at local breweries and nightclubs in the weeks leading up to Saint Patrick's Day. Washington, DC has one of the largest and one of the most well-attended Saint Patrick's Day parades in the country. Washington's Saint Patrick's Day Parade is called "The Nation's Saint Patrick's Day Parade" and features floats, marching bands, and fire, military, and police brigades. If you pay close attention, you may also see the president of the United States waving to the crowds. For Irish food and drinks, check out Irish Restaurants and Pubs in Washington, Maryland, and Virginia. 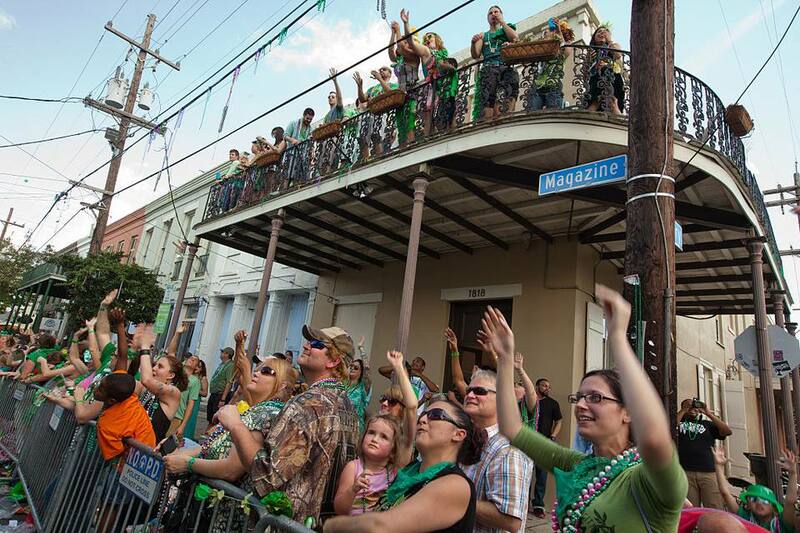 The Big Easy can't resist a good party, so New Orleans pairs Saint Patrick's Day with Saint Joseph's Day to create a week of fun. Saint Patrick's Day in New Orleans includes a mass at St. Mary's Assumption Church followed by a parade to the Irish Channel. St. Joseph's Day, a holiday celebrated by New Orleans' Italian-Americans falls on March 19th and includes a parade that marches into the French Quarter. If you have the luck of the Irish, then you'll find yourself in warm Los Angeles for Saint Patrick's Day. The City of Angels becomes the City of Leprechauns during the Saint Patrick's Day season, with events such as the L.A. County Irish Fair and Music Festival and several outdoor concerts and food festivals. Keep your eyes wide open because you might run into some Hollywood stars.